The popular Winter Village subtheme began in 2009 and continues to expand annually. 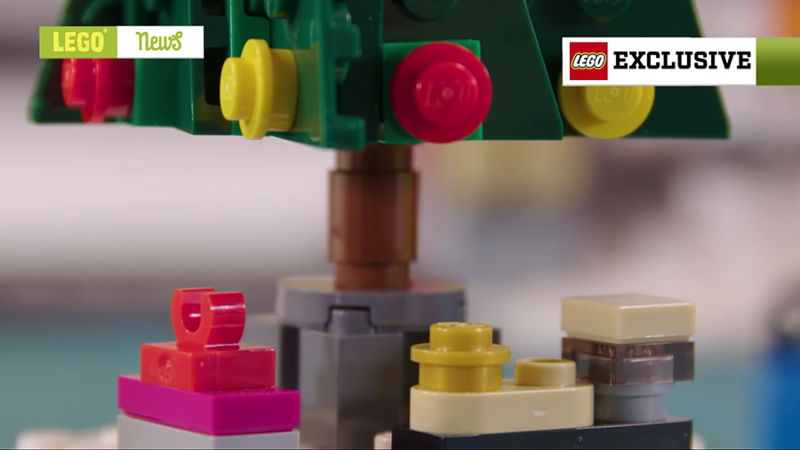 A couple of teaser images for the 2018 model have today been revealed on LEGO News, showing some smaller details that we might expect to find in this upcoming set. 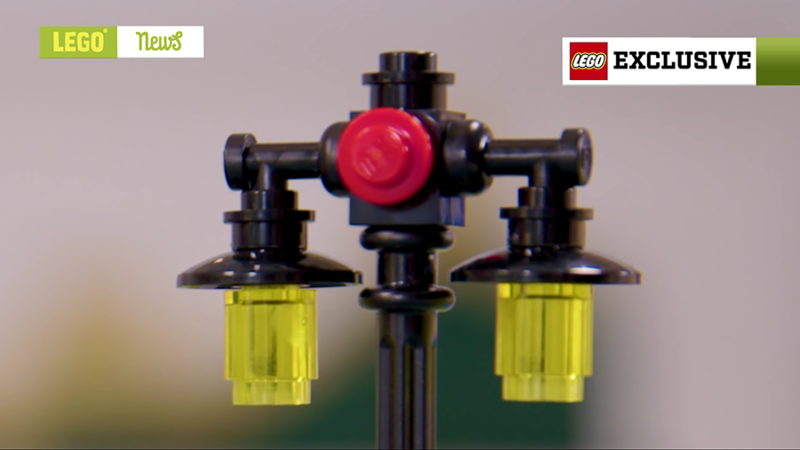 In addition, it has seemingly been confirmed that the set will be officially revealed on the 9th of September, although that seems somewhat unlikely as LEGO products are rarely unveiled on Sunday. What do you think the Winter Village set might be this year? Let us know in the comments. I think it will be 'Christmas Emporium', a shop where you can buy all things Christmas related, including trees, decorations, etc. Many of these sort of stores I have seen are fashioned to look like a barn on the outside. I think this might be the same. Well, at least that's my guess. Based on that phone, I think a Winter Village Museum of Technology is the only likely option here. The bottom picture appears to have a oven, stove and perhaps a coffee maker next to it (in addition to the cup). I'm going to guess café. Has to be fire station. Look at all the red exterior work, particularly behind the snowman. 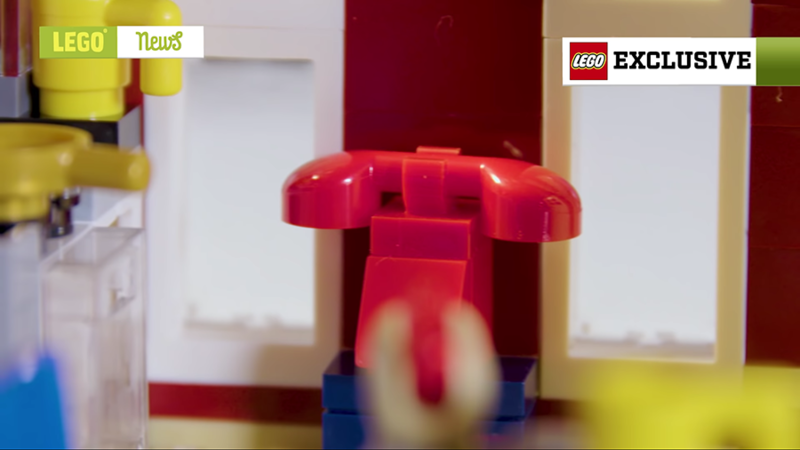 The red phone is the key (and I dont think its going to be the bat cave). It looks to be situated upstairs in the galley so the firemen can get the call and slide down the fire pole to their waiting engine - hopefully an old-style engine a la 10197 Fire Brigade! Only other possibility is Santa's house, but that seems to close to the workshop. At last! Cloud City revealed!!!! Looks neat but honestly, I am interested on those coming soon images from the Overwatch sets, SolidBricks got me with the costume photoshopped boxes. Although I think a Fire Station would not be best, I agree that it is one. Look at the Fire Call Box behind the snowman. It will not be a Post Office as we already have one in the line. It could be the bat cave- I can see the penguin in one of those pics. Anyway, it wouldn't be a proper Christmas scene without a Robin! Why does the snowman look like a duck? I hate to say this as I used to really love this line, but I'll be really disappointed if it's a fire station, much like I was disappointed the last 2 years also. Having said this, I'll buy it just for completeness as I have all the others. But, come on, there are SO many other specifically winter-themed things it could have been, instead of re-hashing a CITY staple... I hope I'm wrong! I think it maybe a center square or a building in the square? I look forward to this set. I look forward to the official and final reveal pictures in September. Don't care for all that teaser stuff that often gets our hopes up for certain things and then destroys them once the final images arrive. I'll keep my enthusiasm curbed for the time being. That way I won't be disappointed...too much. I don't want a Fire Station, but LEGO does seem to like Fire Stations so I wouldn't be surprised. The red with white windows makes me think of the red painted houses quite common in Scandinavian countries. Also the blue surface has me thinking [frozen] lake house. But enough speculation, will they just reveal the set already? Please! Ah, a new edition to the ever expanding list of awful Lego snowmen. Honestly, there needs to be a CMF of someone in a snowman costume that can be easily turned into just a snowman. Seriously? A fire station? So next year we'll be getting a WV Police Station? I'd love some kind of ski lodge/mountain or a larger city square but I'm leaning towards fire house as others suggested. If that's the case next year will be a police station. Red phone... going with fire house. Or Wayne Manor. Also, @Jackthenipper - i would totally buy a Winter Village Millennium Falcon. Lots of small non coherent builds that lots of folks have brought before. A Santa's Sleigh that won't fit through the main build doors. A lookout post that doesn't belong anywhere in the set. Two evil Snowmen troopers with one carrot firing gun to take on the entire village population. I wish they'd get a good looking snowman model. Maybe it will include the missing Xmas-themed minifig missing from this year's Star Wars calendar! Not sold on the Fire station from the images we have seen, the last one looks like the inside of a lodge or a cottage. Great set of images to get tongues wagging but don't reveal anything substantial. Can't wait for the official reveal. I sense a post office coming soon, the snow man is a bit deformed though..
Fire Station, Fire Station, FIRE STATION!!! Although I might be interested in a classic fire truck for bringing Father Christmas to the big Christmas tree, I would be torn to see yet another fire station. I already have two of those. On the other hand then I might go for the train station from last year which I do not have. But what's a fire station got to do with Christmas? @ra226 - thank you - I’m here all week - try the scampi! Seriously though, its a bigfoot tracking station. The phone is for calling in sightings. @woosterlegos, such barn could contain a restaurant too. BBQ sounds yummy! Dark red walls, bright red 8 wide door (see grey slope bricks underneath). 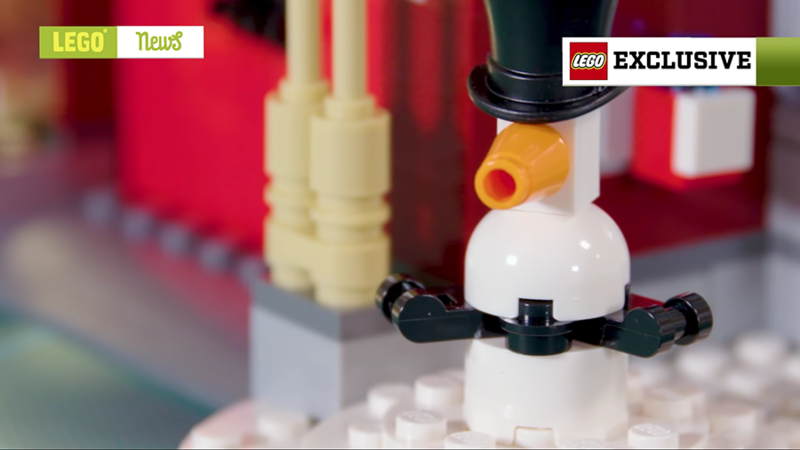 Might possibly be a trans blue brick on the white box on the wall behind the snowman/snowthing, carefully covered by the LEGO Exclusive overlay. Really looks like a firehouse from that one picture. Odd that it has a christmas tree though. Looks like @The Toymaker might be right with the inspiration (red doors instead of green though). I'd be okay with just another house. Where do these people live in the Winter Village? ...But as I look at the pictures again, I can see how the background of the second picture could be a driveway leading to a red garage door for a fire station. And there wouldn't be much reason for picking red for the phone color if it wasn't an emergency line. I was hoping for some sort of ski lodge/ski slope with hundreds of white pieces and trans light blue pieces for snow and ice! Sure, a Winter Village Fire Station. Doesn't seem absurd at all. A fire station, cool! (its obvious because of the red, white and blue box behind the snowman.) This is great since I missed out on the old fire engine in Fire Brigade. Maybe a Christmas bake shop? Or refuge house for deformed snowmen? @ScoBo, I think you are on to something brilliant here. What if TLG released a Winter Village themed Creator set of a Winter Village home with three different, but complementary builds? If they did this every second or third year, I would buy three sets each year that they did so. It would be a wonderful way to populate a village scene. I am guessing I am not alone. The beauty of this would be that each of these releases would have a longer shelf life since every collector, AFOL, or kid wouldn’t necessarily have the resources to buy three at once and would want to space them out. I doubt it will happen, but at least I can dream, and especially at Christmas time. I don't think it's the Winter Village Sausage Delivery Helicopter that I was expecting. That bottom picture is definitely a kitchen of some description, but I'm not sure this looks overwhelmingly like a fire station. That snowman looks ghastly, though. Are they just getting worse? The box to the right of the snowman in the second photo looks like an emergency alarm/call box (similar but smaller to the one on the Fire Brigade modular set). Then there's the red, very emergency-looking red phone too. My vote is something fire-station related. Hopefully they don't "waste" too many of the parts on a fire-truck build. Maybe something simple like a horse pulling a fire tank trailer or similar. The sad thing is that the snowman from the first winter village set from 2009 looks no different in quality from 2018’s winter village set snowman. In fact, it may be arguably worse. Xmas lego store! So meta. Although quite likely, but being a fire station in a winter village series seems to me not a very fitting design. What I expect for this line, are designs that reveal a kind of 'christmassy' 'magical' 'peacefulness'. Please if this year it is a fire station, how about next year a police station...? Then a hospital? How practical. I'd rather it be a kind of Ski Lodge + Cafe combined. That’s a snow penguin. Maybe it is Batman! ?? This year is a fire station and next year is a very nice vintage fire truck. If this years set is a fire station, I'm so not buying it! It seems a lot of people do not connect Christmas with the fire brigade. At least here in Denmark it is not unusual that Father Christmas/Santa Claus is arriving in a fire truck when it is time to light the Christmas tree on the town square. Eventually he is using the ladder or lift to get up to the top of the tree. And to judge from the pictures I get when I google "Santa Claus fire truck" it might be seen in other places too, not least in the USA. At the yearly World Santa Claus Congress held in July at the Danish amusement park Bakken there is a parade including Santa Clauses from around the world - and fire trucks. Since a fire station is not very festive, I am going with a red barn to hold a horse and sleigh that has a loft apartment. sells Christmas trees and has a red phone to call Santa. When I saw the red phone my first thought was of a red nuclear phone. So, my guess is it's "Khruschev's Winter Dacha." How else are we going to get a Nikita Khruschev minifig? Looks like it could be a fishing lodge on a frozen lake. The building seems to be raised up slightly with possibly trans blue below it. It amazes me everyone thinks it's a fire station because of a red phone. Maybe the only color currently in production for that phone piece is red. Maybe it's red because it's Christmasy. Looks horribly like that tree is made up of all right-handed wedge plates with no left ones to match. Last year the Station (and the Jungle Exploration Site) both left you with mis-matched parts, and this looks to continue that awful trend. And the snowman, as usual, looks rubbish. Does anyone find it ludicrous that there would be a fire station when there is snow around? Just shovel snow on the fire! Haha I know its not that simple... but do something besides a fire station... PLEASE! Wondering if hotel or hostel since train station would likely bring visitors? Or lodge for winter activities? With 2018 having many mountain related sets (especially City) my money is on a winter village mountain rescue HQ. It’s more in keeping with WV and this years theme. That’s my 2 cents. Every holiday season, the local fire station sends a fire truck with Santa riding on it, to bring holiday cheer to the surrounding neighborhoods. I LOVE this tradition, so I'd be thrilled to add a fire station to my Winter Village! I'm surprised the fire station idea is getting such a negative reaction; am I the only one who loves seeing the fire truck Santa roll through the neighborhood in December? 10263 Winter Village Fire Station confirmed!